Journey back in time with me over the last two months to hear what I’ve been working on, and get a few tips of things I’ve discovered along the way. To learn any of the tips, I’ll have them only in my podcast episode. There will be a little drum beat before each one. Quiet but hopefully helpful in organizing when something new is coming your way. Hand embroidery project BOM (version 4 out of 4). Previous posts for other versions of embroidery blocks for the guild. As you may be able to see the edges are serged. You may also notice it isn’t finished. Why didn’t I work on it this afternoon? Why? Why? Due Tuesday and this takes me a long time to do. Plus the knot in the blue thread. Ack! All the tons of pieces I had to cut out and sew together! There’s 72 + 72 + 72 HST’s here. There’s 13 + 13 + 13 strips of four fabrics here. 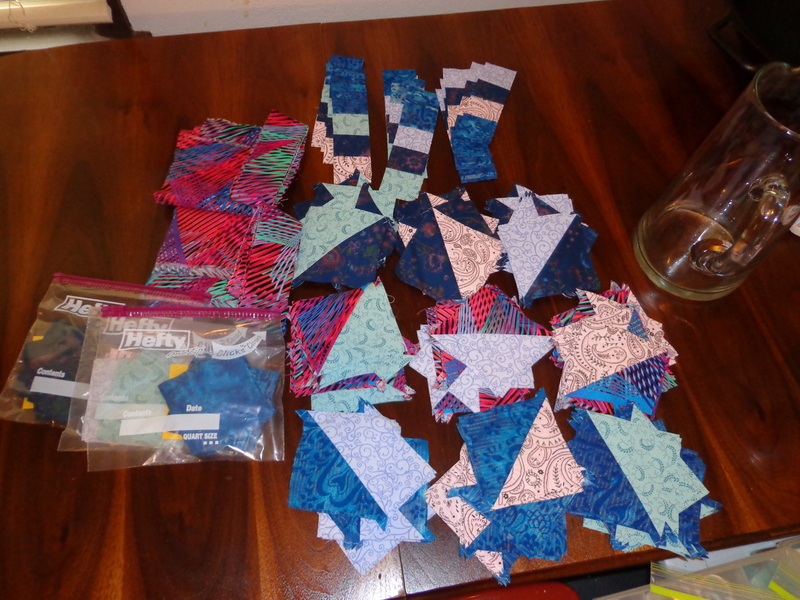 There’s 36 squares here of each fabric (in baggies), and two long borders of focus fabric. 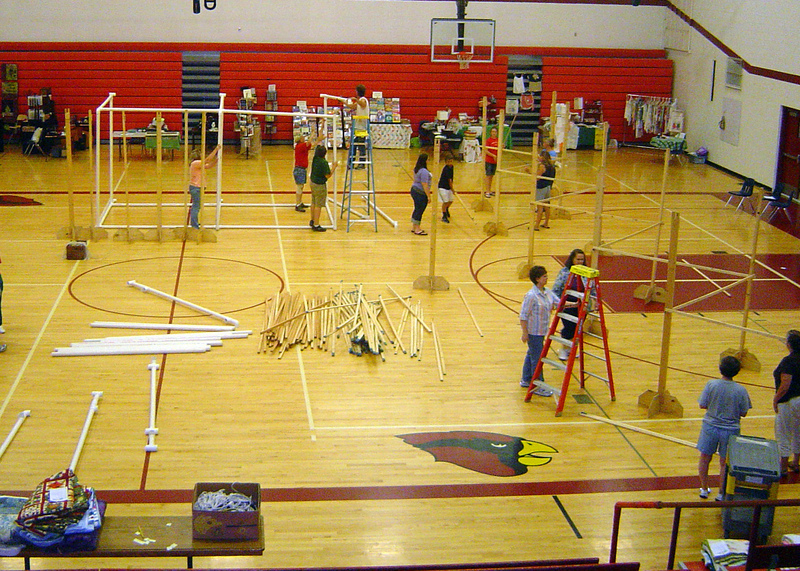 The workshop is later in October during a Saturday afternoon where we get to see what this looks like. So they work together I think. Phew! And here’s the TA – DA Triangles I referenced in the episode. 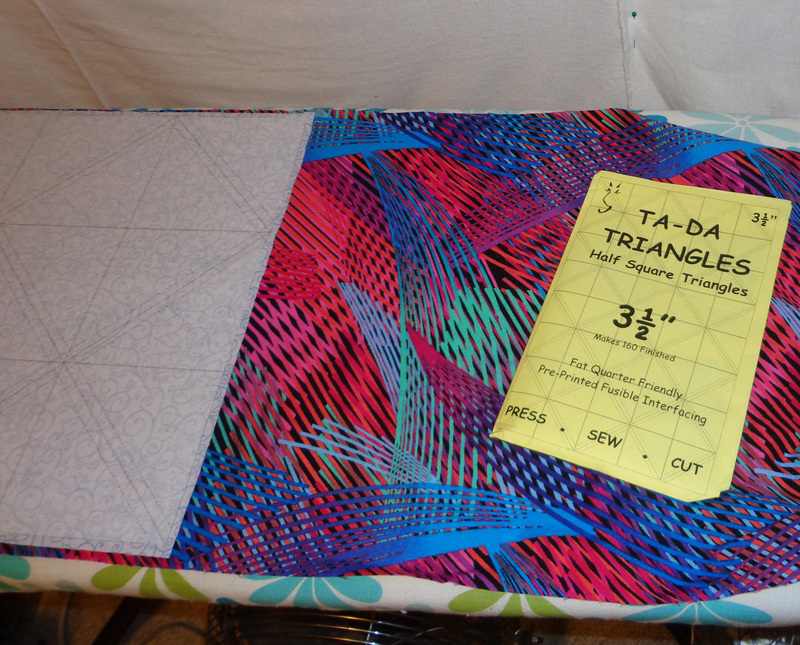 I cut the interfacing into manageable strips so I could cut the fabric better and sew it cleaner and easier. The strips are three squares wide by 4 across. And here you can see the Kicker border, in addition to the invisible (can’t you see it?) aurifil monofilament thread – LOVE IT! 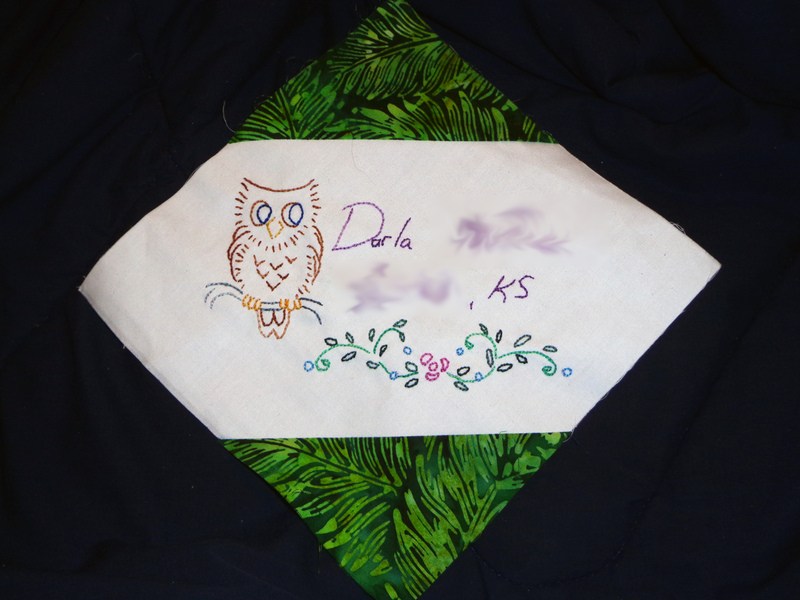 And see, I really did quilt the letters all the way through. Two steps in one! 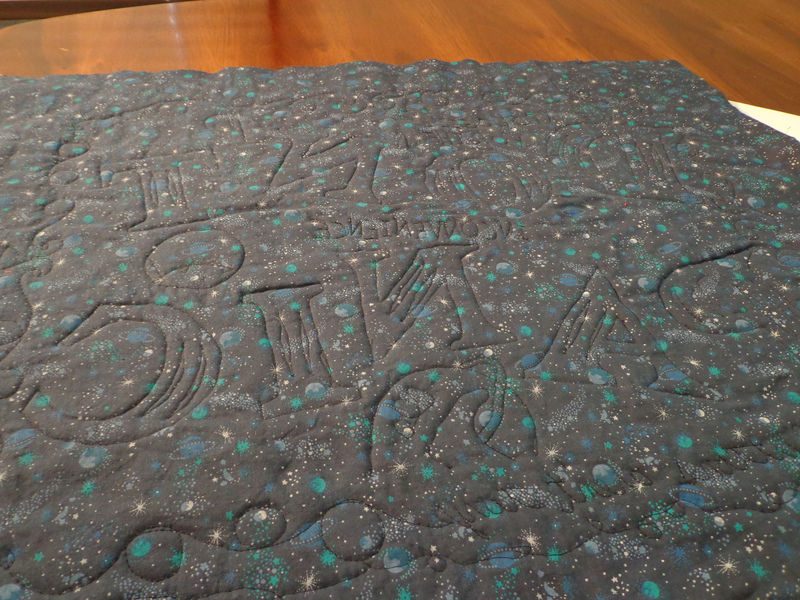 And here’s a close up of the quilting! The alternate blocks of the square in the square is great for setting with the card trick. 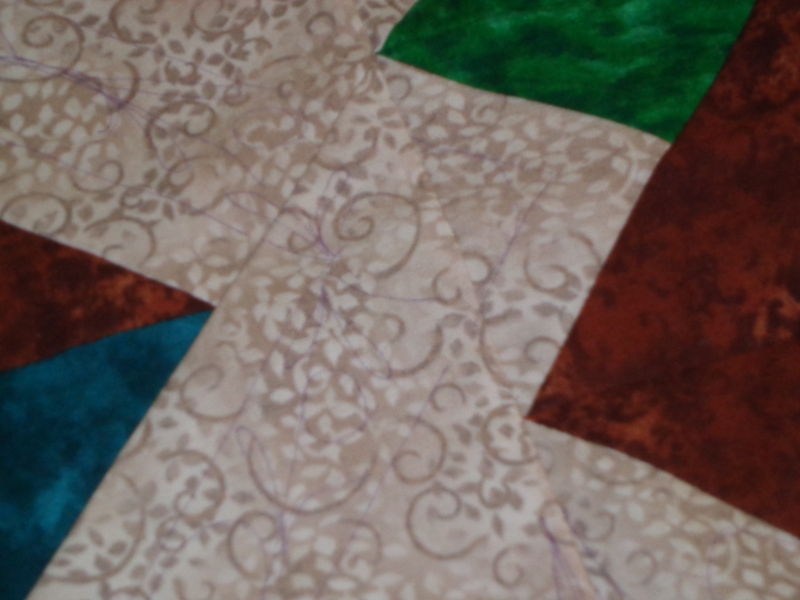 Here’s a close up of the convex / concaveness of the two blocks together – meant to see the quilting designs, but does not show up well. Some of the items referenced in the episode. 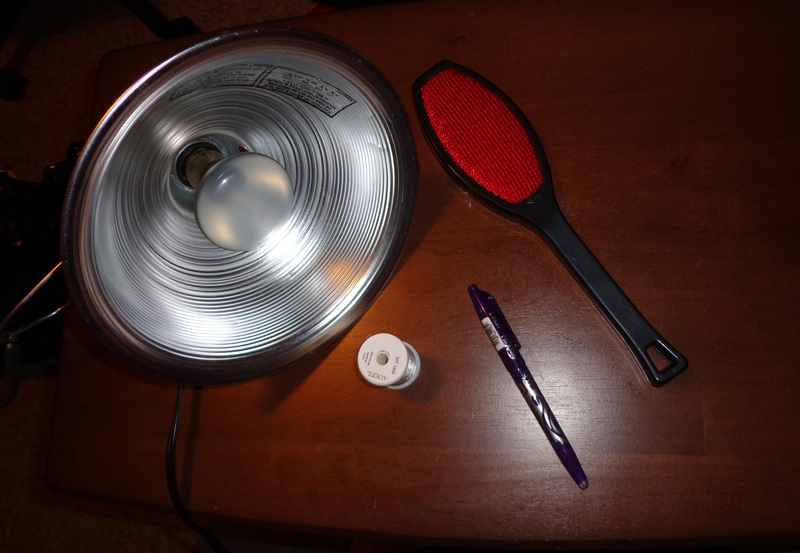 Lint brush, light with parabola cover, aurifil monofilament thread, and frixion pen. 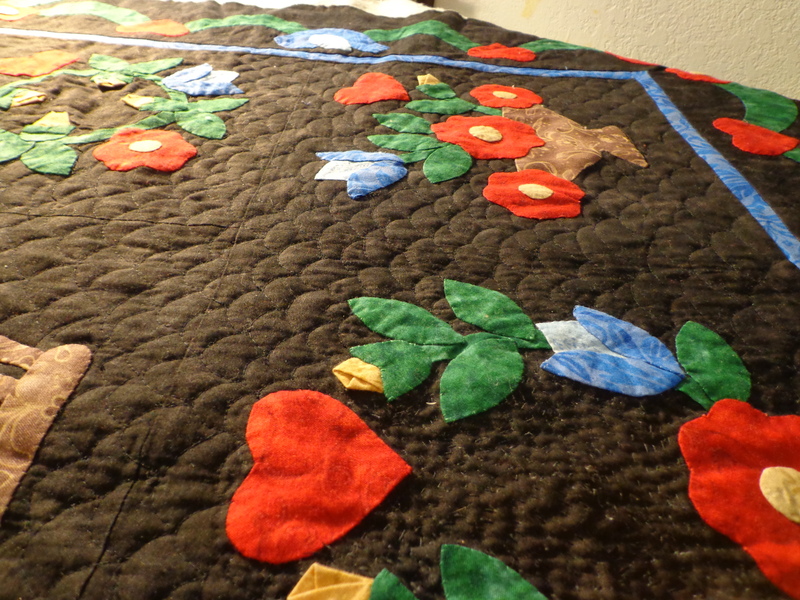 Still getting good comments about my quilting progress. And I wouldn’t say healed exactly, but, getting better, mostly stronger every day I do not deal with the issue that caused me grief a few weeks ago. 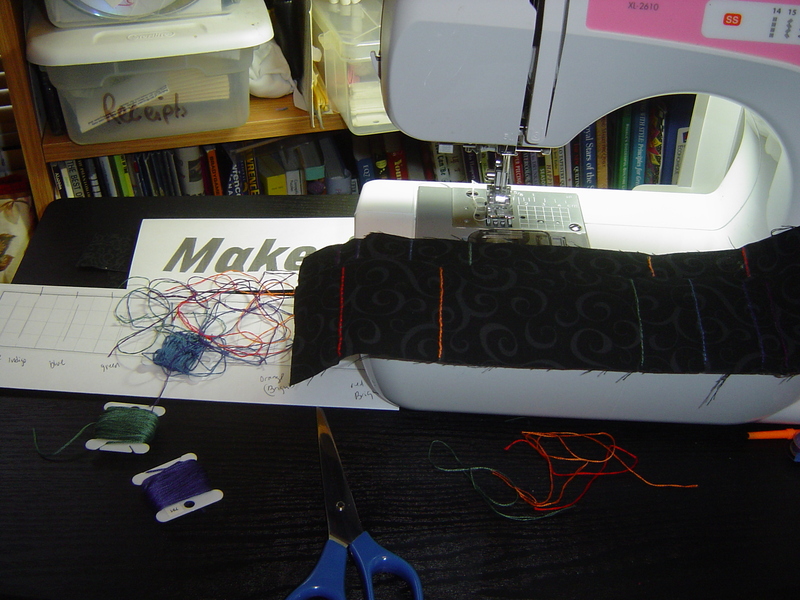 I have since bound fully the 2 quilts from last weekend’s post, but I have seemed to misplaced my millner’s needles that I use all the time for applique & binding. Since I realized this on Sunday morning (LQS closed Sunday & Monday for Labor Day), I haven’t gone out to purchase & finish those projects displayed last week. Our guild pizza box, a personal BOM that each member is doing. If you’re late to the game, each member decided their own BOM and we’re passing it along the members that are participating. We have about 12 ladies doing the Pizza box, and 5 of those are hand embroidery work! I think one is applique (haven’t gotten to it yet), none are paper piecing (I should have done that myself), and several are specific blocks. The reason so many are embroidery is complicated & simple. 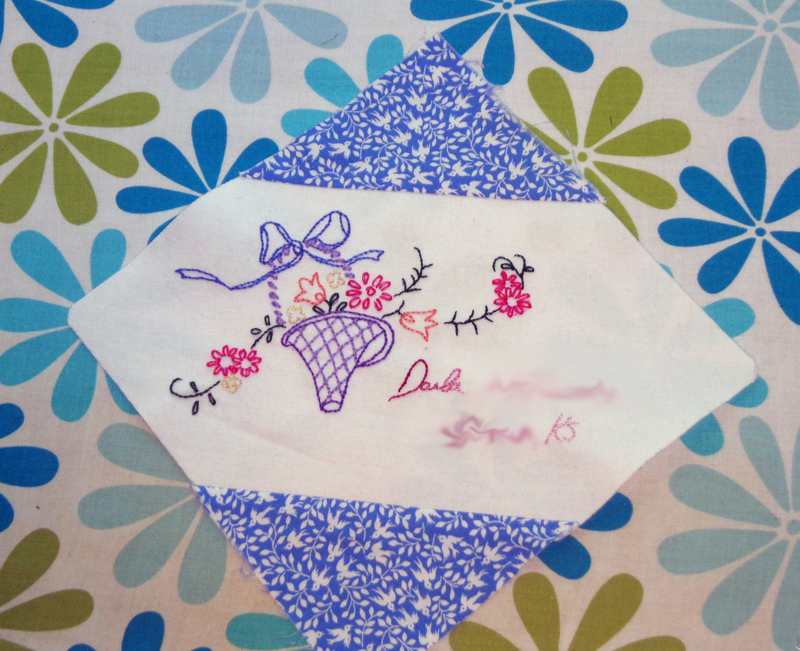 Our Ruby Stitchers group is our Applique Society group, and is going really strong. I don’t attend myself, but I do enjoy the art of applique, embroidery & handwork, but making the meetings would be another hard thing for me personally. So I’d consider joining. 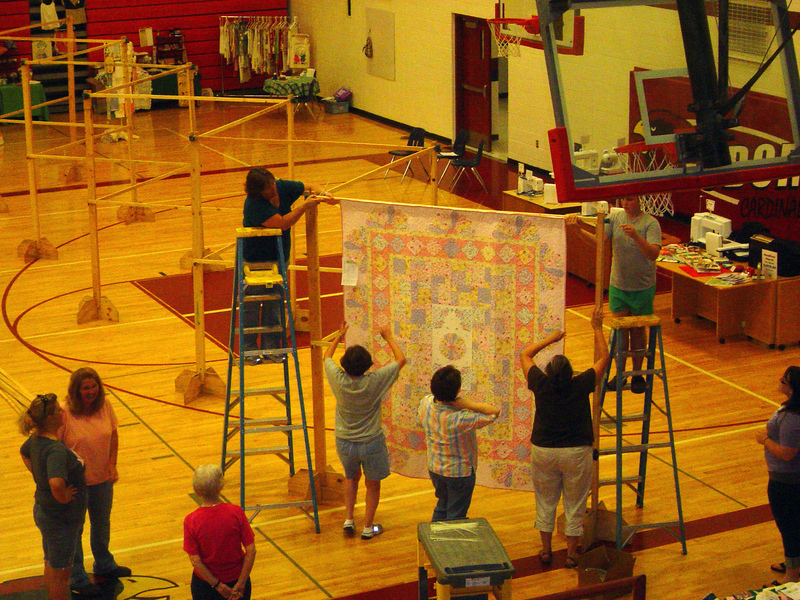 Also, our Local Quilt Show is very active in embroidery, and particularly twilling, something that they have lots of supplies & experience in making quilts with the redwork right there on the quilts! So we have over a third of the pizza boxes are hand embroidery. 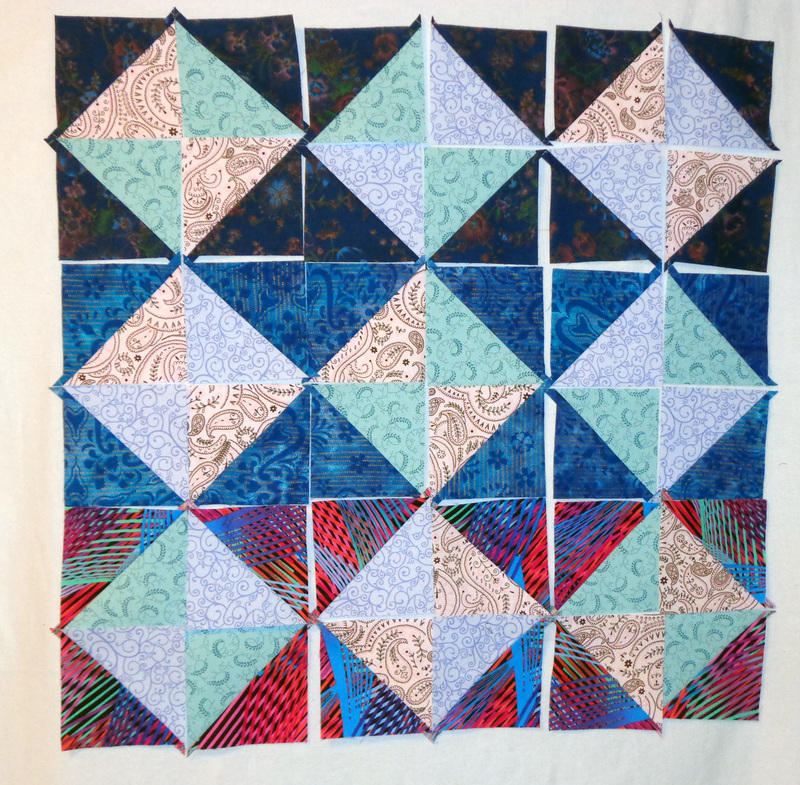 Which I like, but when can I sew blocks together. Also several members doing hand embroidery for their blocks were put on the list one right after the other because of late sign up to the list. And as such, a plethera of embroidery is happening here. So here’s a post that shows them all together. 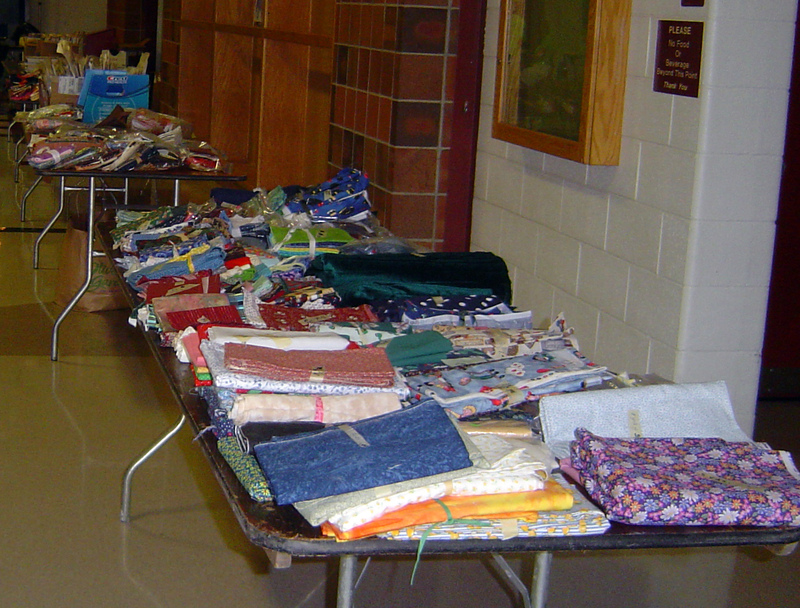 The first one was for the quilter who designed the swap & organized it. I had downloaded the pattern over 2 years ago and was just itching to use it in a block somewhere. The quilter really loves pinks, purples and these colors so I kept to that theme. I think this turned out really rather nicely! I received this block in May. 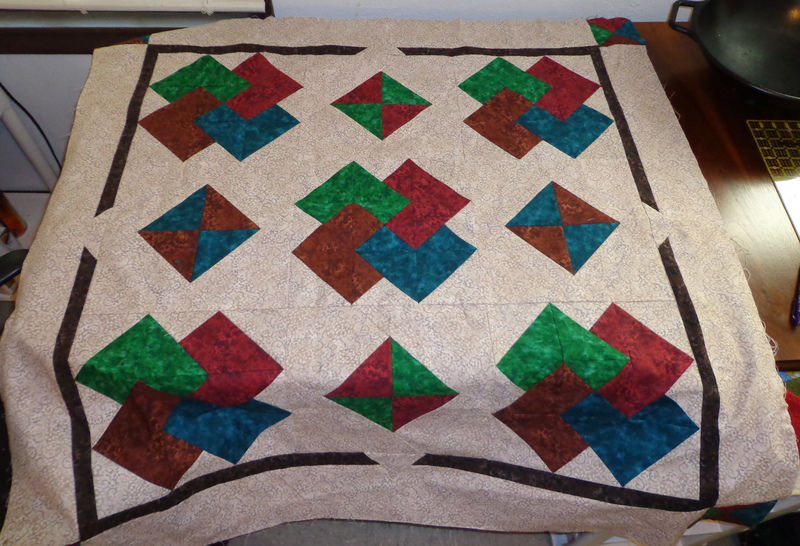 The premise was that the blocks were done by the quilter giving out the challenge, with stabilizer on the back. And we were supposed to embroider something including our name & location. So I didn’t get to chose the block color on any of these, except to pick out of the premade blocks my favorites. The next one uses batiks. She had lots of drawings of bugs, animals, and seemed to want a nature themed block. I loved this owl I saw, even though it took me a while to find it (on a free coloring book picture I think). Of course now I kinda wish I had done a swan, because owls are somewhat overused. 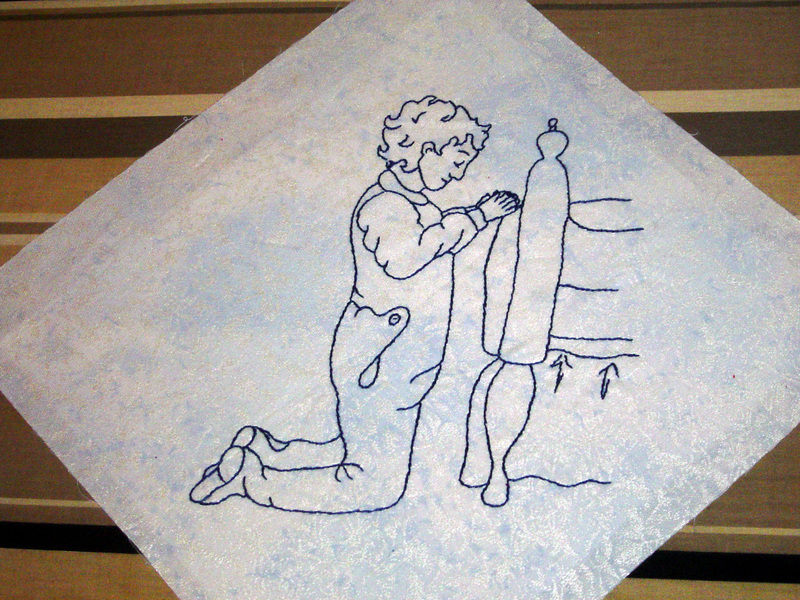 But this quilter is smart, willing to work for the guild, and a new member. The owl is likely to be the only one of its kind, which I sorta like too. I received this block in July. The last one I’ve had the privilege to work on is for one of our oldest members. 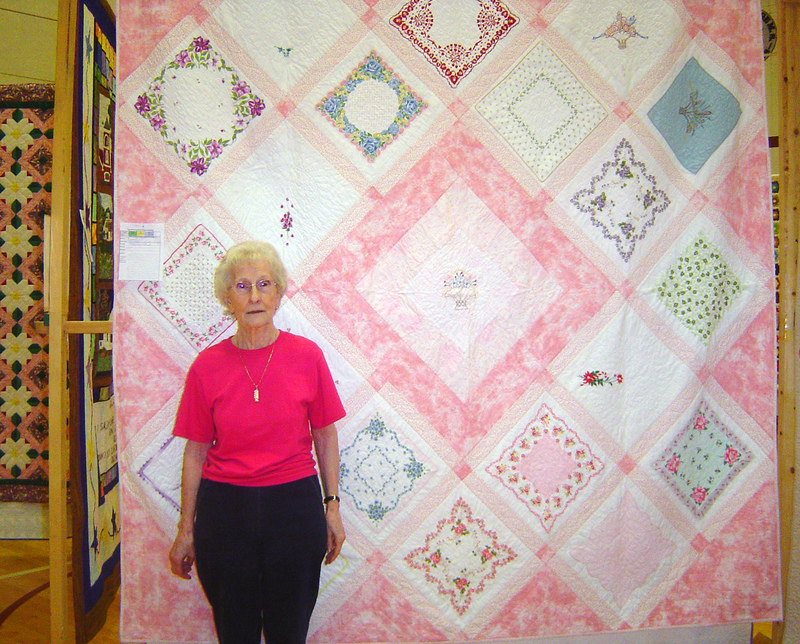 She does a superior job quilting, her quilt won the largest quilt category with her pralines & creme quilt from the tucks and textures quilt book, which she all did by hand with the help of another lady in the guild. I should have whitened up this picture like I did the last two, the background is white, not grey. This quilter is classic, does fantastic handwork, and she is so elegant that all I could think of with her was the word, “rose”. So I had to make sure I found an embroidery of a rose. Then substituted a rose in the corner piece as well. Here’s a picture of all three embroidery pieces together in a mosaic. Three different styles. A lot of handwork & time. Here’s to 2 more blocks in the future! 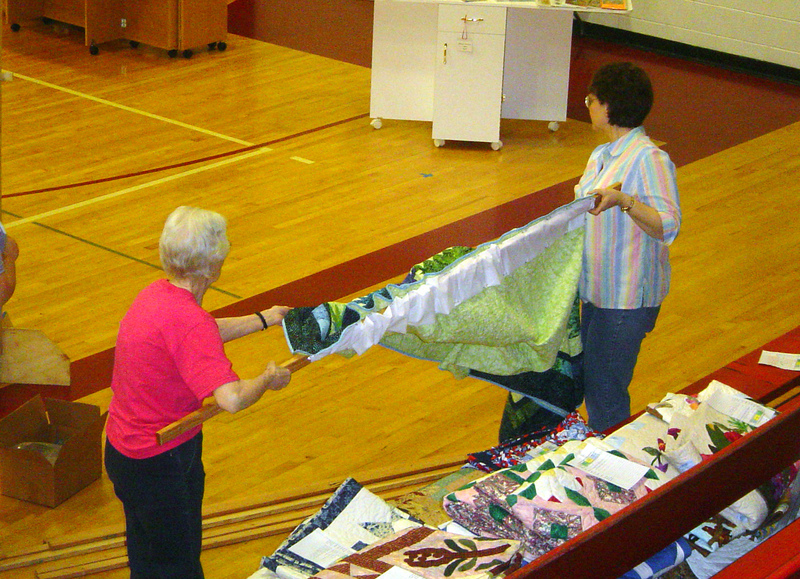 We’ve gone behind the scenes of the local quilt show. First there are questions about how you want to organize your show, meant for reflection on how your current show is running or how you could work on a new show. 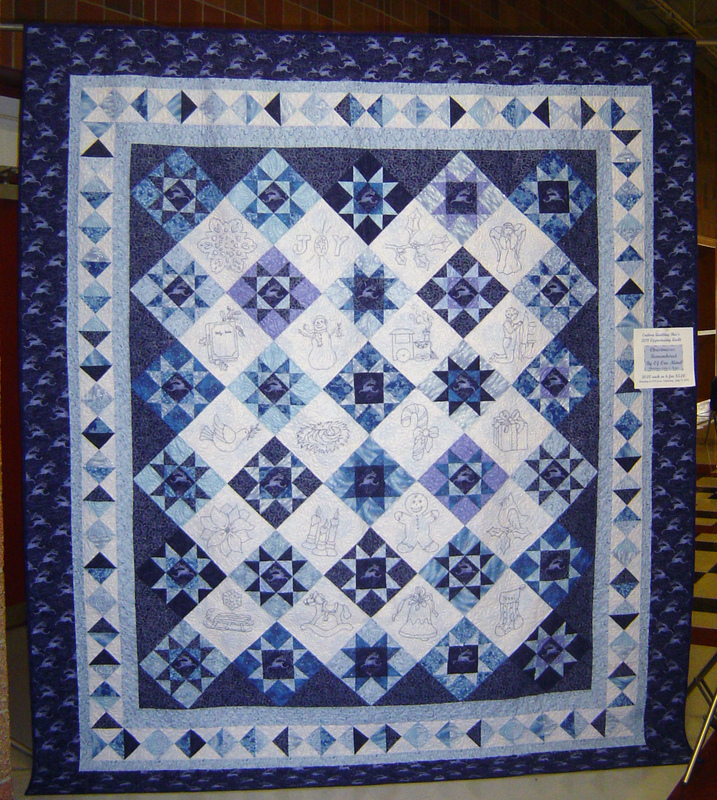 For photos of the quilts themselves, go to the guild’s shutterfly page. Today I can call myself an embroiderer because I officially “finished” my little applique design embroidery study. I was going to make a small wall hanging out of this to hang below my ‘baltimore style applique quilt’, but maybe this is destined to be a pillow instead. What do you think? 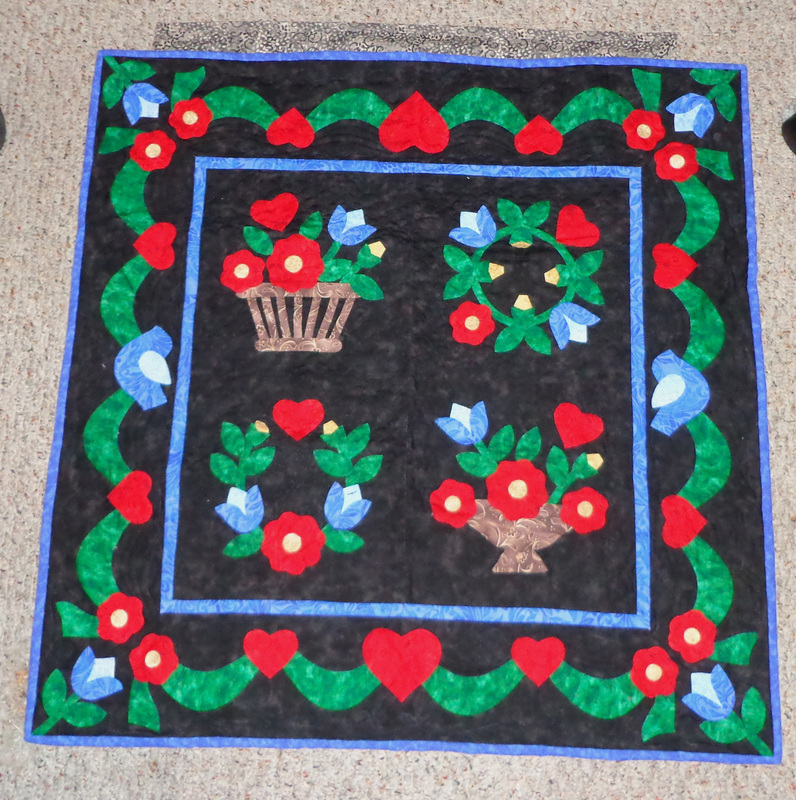 This was done with leftover pieces from the mimi dietrich applique quilt I did. The pattern pieces are hers, but the layout is my own. I had several variations of this design I played around with before settling on this. 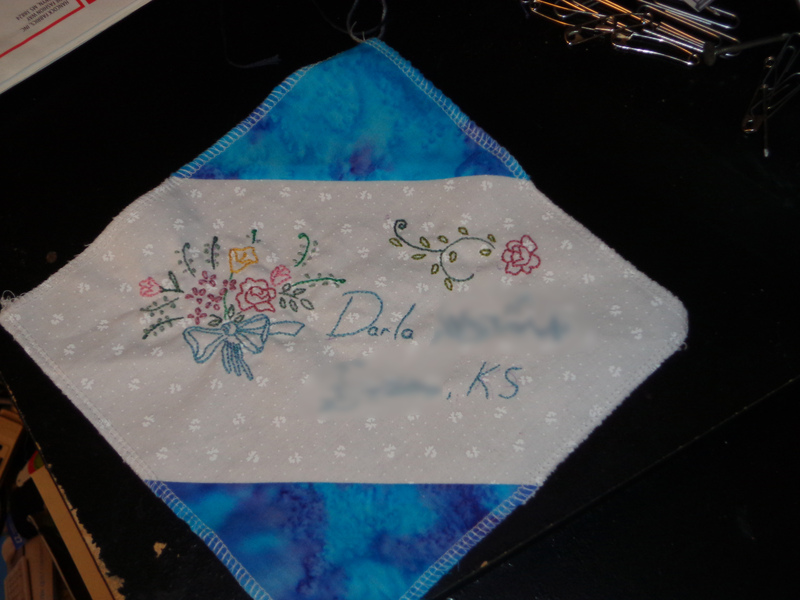 The flower has a little chain stitch and then some small satin stitch. 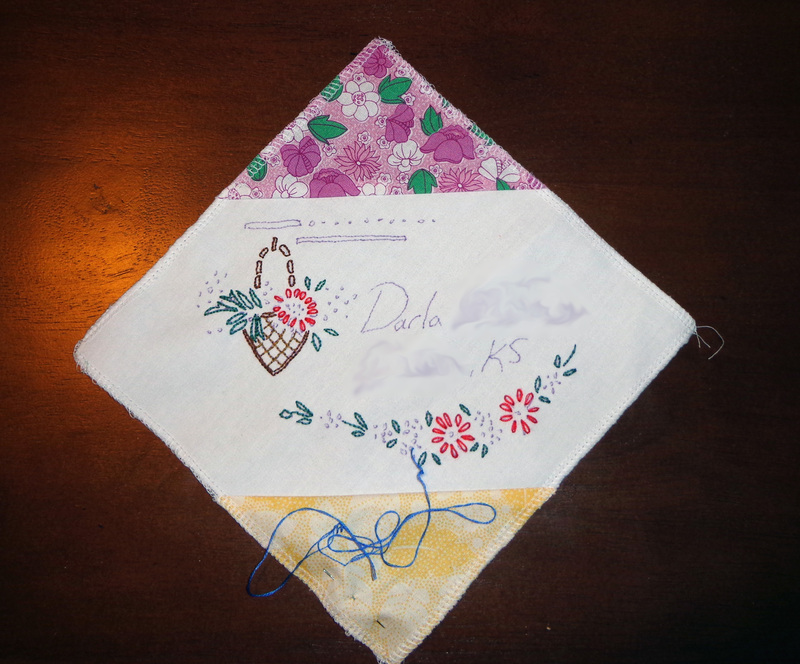 The swag has two blanket stitches (top and bottom in blue), three mountmellick stitch (middle blue, middle red and gold, top blue), and a double chain stitch down the middle (gold). On the bird, I used a blanket type stitch for the beak (probably my weakest choice of stitch is on the beak), a modified algerian eye stitch for the eye, and stem stitch for the bird feathers. And its not photographing well by itself, but I used stem stitch on the heart, and inspired my swirls from the fabric pattern within. There are red swirls which are “echoed” by the dark dark navy blue (looks like black … shhh don’t tell anyone it’s not black). 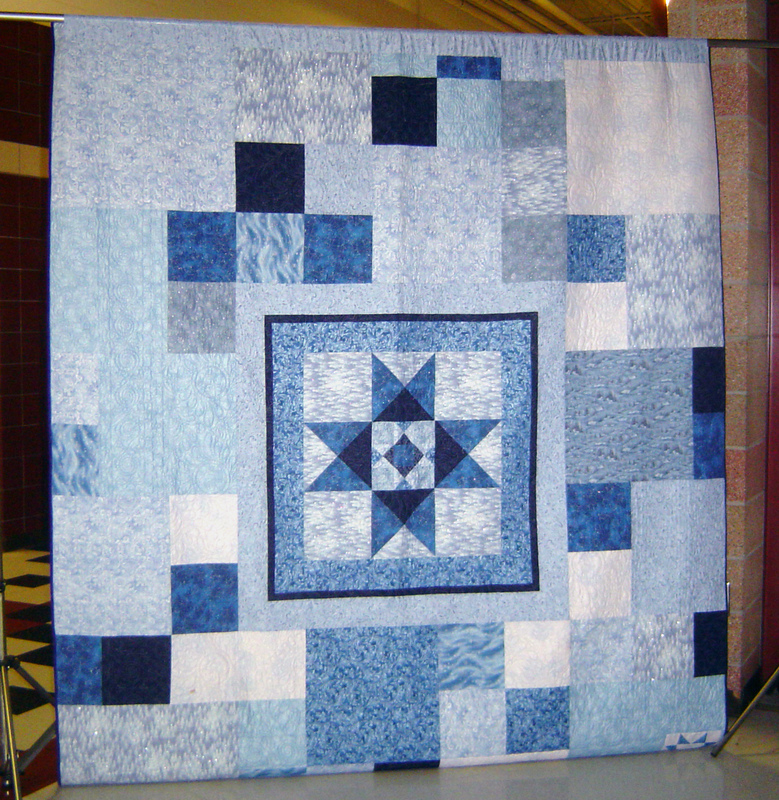 In any event, I’m going to try my hand at hand quilting this just to get the feel of hand quilting. But I don’t have any supplies for hand quilting. Have to go find a thimble and a quilting hoop first. And probably some hand quilting thread. 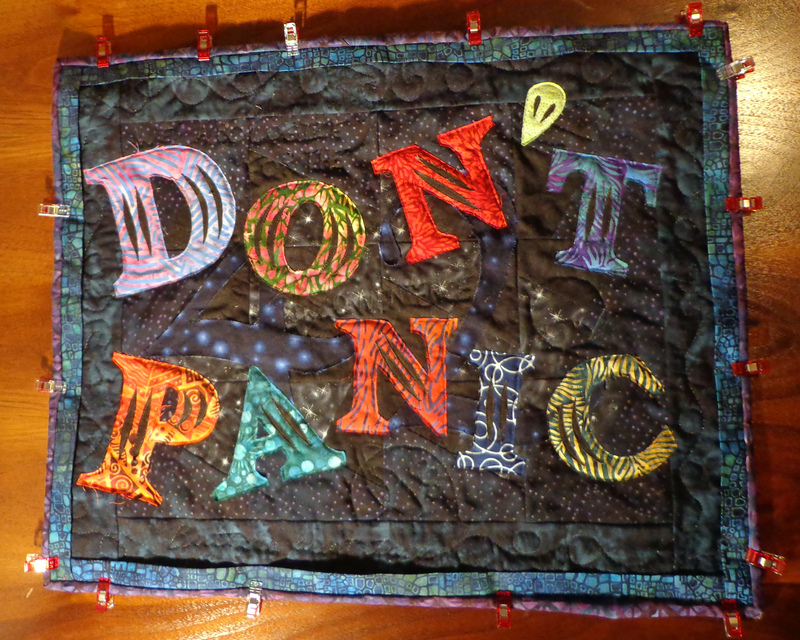 Time to pick up another project until I get to the quilt store (after the holidays). You are currently browsing the archives for the Embroidery category.